The name of this organization shall be the Central Indiana Grotto of the National Speleological Society. II. The purposes of this grotto shall be the same as those of the National Speleological Society with the additional purpose of organizing members of the National Speleological Society in the Central Indiana area to promote the objectives of the National Speleological Society more effectively. B. The Executive Committee shall have complete power to manage the business of the Grotto, to formulate by-laws, to raise funds in any manner not inconsistent with the policies on the National Speleological Society, and to perform all other necessary functions. C. Decisions and actions of the Executive Committee may be over ruled by a two-thirds vote of the Grotto members present. A. Executive Committee meetings and Regular meetings shall be held at such times and places as are determined by the Executive Committee. B. A petition signed by two-thirds of the Grotto membership shall be mandatory upon the Executive Committee to call a special meeting for the purpose stated in the petition. A. 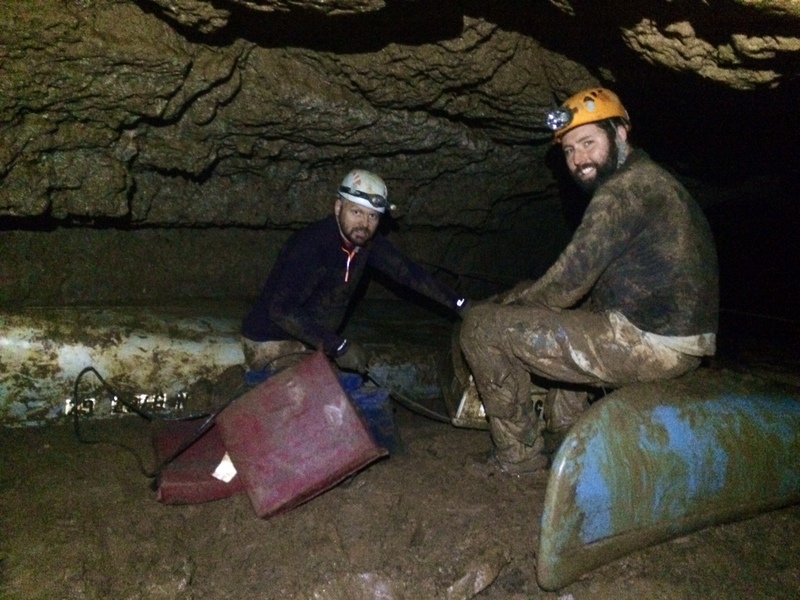 Regular membership is limited to members of the National Speleological Society. B. Associate membership shall be available to those not having membership with the National Speleological Society for a term of one year, at that time they must join the National Speleological Society or be dropped from the Grotto’s list of members. C. Any member of the National Speleological Society shall be eligible for membership in the Grotto. VI. The Constitution and By-laws of the National Speleological Society shall be binding on the Grotto. Any action inconsistent therewith shall be null and void. VII. Amendments to this constitution shall be made by a two-thirds favorable vote of those present at any meeting of the Grotto called by the Executive Committee especially for that purpose, or by written consent of one-half of the total membership of the Grotto. A. Elections shall be held at the regular December meeting. Officers shall take office on the first day of January following the election and shall serve for one year. B. No one shall hold the same elected office for more than two consecutive years. C. Officers shall be as listed in the Constitution and shall be elected by a majority vote. For the purpose of establishing a majority vote, abstentions and blank votes shall not be counted. D. Elected officers shall be regular or higher members of the National Speleological Society. E. Vacancies of office shall be filled by appointment by the Executive Committee. The officers so appointed shall perform the duties of the office for the remainder of the term. The consecutive term ruling shall not apply to such a term unless it exceeds six months. F. The Chairman shall appoint, with the approval of the Executive Committee, such other officers as are necessary for the operation of the Grotto. G. Appointed officers shall be members of the Grotto. 1. A regular motion, in writing, shall be made and allowed at a regular Grotto meeting. 2. Notice in writing of this motion shall be made to the membership at least one week prior to balloting. 3. The motion shall lay over until the next regular meeting, at which time it shall be read again and balloted upon. A two-thirds (2/3) vote of the membership present shall be required for the motion to pass. 3. Serve on committees at his option. 4. Call meetings of the Executive Committee. 5. Responsible for timely submission of all legal documents. 1. Perform all duties of the Chairman in his absence. 2. Serve as Membership Chairman. 3. Assist the other members of the Executive Committee when needed. 1. Record minutes of all meetings and prepare them for publication in order to be made available at the next Regular meeting..
2. Take care of all correspondence. 1. Process all income and expenses. 2. Keep an accurate and timely account of receipts and disbursement and submit a quarterly report to the membership. 3. Prepare financial statements as needed. 1. Serve as members of the Executive Committee. 2. Perform other duties necessary to the operation of the Grotto. A. Regular meetings shall be held on the first Wednesday of each month at a meeting place designated by the Executive Committee unless re-scheduled by a vote of the membership at a prior Regular meeting. B. Special meetings may be called by the Executive Committee. C. Special meetings may be called by a two-thirds vote of the Grotto members present at a Regular meeting. D. Robert’s Rules of Order, as revised, shall govern all procedural questions not specifically answered by these by-laws. A. Persons applying for membership must be sponsored by two regular members. Sponsors must have been a CIG member for one year. B. The receipt of the membership application will be announced at a regular meeting. The membership may request that the application be approved by a two-thirds favorable vote at any time before the end of the following regular meeting. For the purpose of establishing a two-thirds vote, abstentions and blank votes shall not be counted. C. In order to be eligible to be voted upon for membership, a person must have attended three regular meetings and two Grotto trips and must have submitted an application in writing. D. No person may be considered for membership at the same meeting at which his or her application is submitted. An application may be submitted before the required number of trips and meetings have been attended. The Vice Chairman shall be responsible for determining that all requirements have been met before the candidate is considered for membership. E. All active members of the National Speleological Society signing the group application form shall be designated as Charter Members. 1. Honorary members may be accepted by a two-thirds favorable vote of the members present at a regular meeting. 2. Honorary members shall not pay dues. 3. Honorary members may be designated for life or for a certain period of time. G. Regular, Charter, and Honorary members shall be entitled to all the rights and privileges of membership in the Grotto. H. Associate members shall be entitled to all rights and privileges except those set forth in Article V, Part B, of the Constitution. 1. Any member of the Grotto under the age of 17 will be designated a Youth member. 2. Youth members may neither vote nor hold office. 3. By a unanimous vote of the Executive Committee, a person between the ages of 12 and 16, inclusive, may be designated a Regular or Associate member (as appropriate per Section 5 of the Constitution). 1. Subscribers shall be entitled to receive the Grotto Newsletter. 2. Subscribers shall not be considered members of the Grotto. 3. Subscribers may not vote or hold office. 4. Subscribers must pay a subscription rate as set forth by the Executive Committee. Subscriptions shall end with the December issue. 5. Upon dissolution of the Grotto, subscribers shall receive a refund equal to the remaining portion of their current subscription unless such money is not available in the Treasury. K. Membership requirements regarding attendance at meetings and trips may be waived by the Executive Committee. A. Annual dues shall be payable annually at the January meeting. B. New members shall be assessed proportionately to the time lapsed since the beginning of the year. C. Dues must be paid by the March Regular meeting. D. Annual dues will not be accepted from any regular Grotto member unless his NSS dues are current. Grotto members whose NSS dues expire during the year will become subscribers until their NSS dues are paid. E. Family members may join with dues equal to 50 % of the regular member dues. They do not receive a newsletter. 3. The motion shall be held over until the next regular meeting at which time it shall be read again and balloted upon. A two-thirds favorable vote of the membership present shall be required for the motion to pass. B. Any member will be placed in an inactive status for non-payment of dues. Members on inactive status have no rights or privileges, and will be dropped from membership after one year in this status. C. Reinstatement may be obtained by inactive members by payment of the current year’s dues. A. Expenditures exceeding fifty dollars ($50.00) shall be approved by the Executive Committee. B. Expenditures of fifty dollars ($50.00) or less shall be approved by the treasurer. C. The Treasurer may approve expenditures of any amount as necessary for the normal production of the newsletter. A. Equipment belonging solely to the Central Indiana Grotto shall be auctioned among the members in the event of dissolution of the Grotto. B. Only Grotto members may borrow Grotto owned equipment. C. Equipment is to be lent for one week only, unless special arrangements are made. D. Equipment must be returned in the same condition as loaned. E. The person borrowing equipment shall sign for it and is responsible for its replacement or repair cost. F. The Equipment Chairman may refuse to lend equipment to persons violating these rules. G. Grotto equipment shall be inventoried annually by a special committee and the results reported to the membership with all discrepancies explained. A. Upon the dissolution of the Grotto, the Executive Committee shall, after paying or making provision for the payment of all liabilities of the Grotto, dispose of all assets of the Grotto exclusively for the purposes of the Grotto in such a manner, or to such organization or organizations organized and operated exclusively for charitable, educational, or scientific purposes or for the purpose of conservation of caves and karst features, as shall at the time qualify as an exempt organization under ss 501 (c) (3) of the Internal Revenue Code of 1954 (or the corresponding provision of any future United States Internal Revenue Law), as the executive Committee shall determine. B. Any such assets not so disposed of shall be disposed of by the Judge of the Circuit Court of Marion County, Indiana, exclusively for such purposes or to such organization or organizations, as said court shall determine, which are organized and operated exclusively for such purposes. A. Guests must be invited by a Grotto member. B. Each member is responsible for the conduct of his guest. C. Written or verbal permission must be obtained from the owner of any property visited on a Grotto trip unless after a diligent search the identity of the owner cannot be determined or unless the owner has previously given unlimited permission for members to enter his property. A. The motion to amend must be made at a regular grotto meeting and published in the newsletter that is received by the members prior to the meeting at which it is put to a vote. The amendment would then be put to the vote at the next regular meeting and approved by a majority vote of members present at that meeting. Under the above procedure, only minor changes of language from that presented may be allowed at the time of adoption.